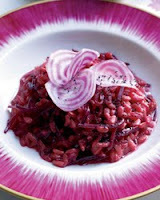 Tip: Beets give this creamy risotto stunning color and delicate sweetness. Try wearing rubber gloves and shredding the beets directly into a stainless steel bowl to avoid staining hands and countertops. In a saucepan, bring the stock to a simmer; cover and keep warm. In a medium enameled cast-iron casserole, melt the butter in the oil. Add the onion and cook over moderately high heat, stirring, until softened, 5 minutes. Add the shredded beets and cook, stirring, until the pan is dry, 12 minutes. Spoon half of the beets into a small bowl. Add the rice to the casserole and cook, stirring, for 2 minutes. Add 1 cup of the warm stock to the rice and cook over moderate heat, stirring, until the stock is nearly absorbed. Continue adding the stock 1 cup at a time, stirring constantly, until the rice is al dente and a thick sauce forms, 22 minutes. Stir in the cooked beets, cheese and the 2 teaspoons of poppy seeds. Cook, stirring, until heated through; add a few tablespoons of water if the risotto is too thick. Spoon the risotto into bowls. Garnish with sliced beets and poppy seeds and serve.